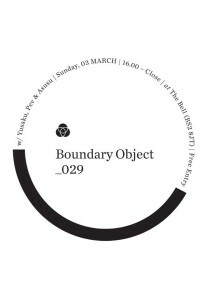 I am going to play DJ at 29th Boundary Object at the Bell which I have visited almost every month since I came to Bristol. According to the flyers so far, you see various DJs in Bristol have played at Boundary Object. For me as a person that has visited and seen it, it plays a role to make opportunities to drink or share a time and space wich people together. The Bell is not a club, but a pub. No entrance fee. Parties take place at the pub where people come and just drink regardless of music, which makes me think it good to see a wide range of people. It has been ages since I last played DJ at a place like this. I suppose music I played and the ways for playing it will naturally change there. Above all, I will play DJ to provoke everyone’s appetite for alcohol. I am looking forward to see how Peverelist and Asusu will play DJ there.